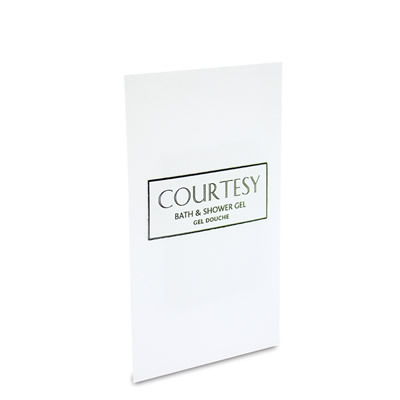 Guest Sized 10ml Sachet of the Courtesy Range of Bath & Shower Gel. These ultra convenient and easy to use guest sachets of Courtesy bath & shower gel. These sachets are the most cost effective way to offer your guests wash room facilities. Each 10ml sachet contains enough bath and shower gel for a single use. The sachets are finished in neutral white with black lettering.